1. How To Care For Discus Fry Between 1"-2"
While discus fry can present an inexpensive way to get into the discus hobby their care can be a challenge for even the best of aquarists. Small discus (I'm talking 2" and smaller here) have very specific needs that if not met can result in their rather rapid demise however if the correct parameters are provided raising them can be a very rewarding experience. I hope to address some of the basic care requirements in this post. This is a summary of the questions that I am asked most frequently. If you are reading this and can think of any additional questions please let me know and I will add my recommendations to the list. #1 Start with good stock. If you start with unhealthy fish it doesn't matter how well cared for they are it is going to be a struggle to keep them alive. Things to look for when buying small discus... they should be active and eat instantly when offered food. Colours should be light (not black). When you view the fish head on it should be thick bodied, not paper thin. The fins should be fully erect, not clamped. Eyes should be clear and well proportioned not too large looking compared to the body size. Large eyes are a sign of stunting. #2 Be willing to do daily water changes. This is the real key to success. A daily water change of at least 90%. I like to start by using a cloth to wipe down the surfaces inside the aquarium I then drain all the water I can, rinse the filter media in the old water, and then refill the tank with water of the same temperature. Add only water conditioner to the new water, no other chemicals or additives. #3 Tank size: I like to aim for a stocking density of around 1-2 gallons per discus. Keeping them densely stocked helps them feel safe which in turn results in better appetites and more outgoing personalities. It also helps to spread out aggression. I also find that covering the back and sides of the aquarium with light coloured paper helps the discus to feel comfortable. #4 Water Parameters: The most important thing is to keep the water conditions stable. For that reason I recommend using dechlorinated tap water and not making any adjustments. It doesn't matter if the PH is 6.0 and soft or 8.0 and hard or anywhere in between. The discus will do equally well regardless of PH and hardness. The temperature should be high, between 86F-88F is ideal. #5 Lighting: Light should be provided 24/7. #6 Filtration: Good aeration is key, an air stone connected to an air pump will help keep the oxygen level high. I generally like to avoid filters like sponge filters because they trap dirt and are hard to get completely clean. A hang on back filter or corner filter filled with ceramic media is much easier to clean and will provide a place for beneficial bacteria to live. #7 No substrate: You need to keep the tank very clean and it just isn't possible to do that with gravel in the tank. A bare bottom tank is essential for small discus. #8 Feeding: A high protein food will provide good growth, Australian Freeze Dried Black Worms are ideal at 66% protein and discus will eagerly accept them. They should be fed as many times as possible throughout the day with the minimum number of feedings being three. There is no upper limit on the number of feedings you give them. #9 Don't mix them with other fish. Gas Bubble Disease is an issue that has been coming up with great enough frequency, especially for those keeping small discus, that I feel it deserves a thread to raise some awareness and hopefully save some fishes lives. What is Gas Bubble Disease (GBD)? GBD is the transfer of gasses from water into the body of a fish. GBD is caused when water supersaturated with gasses is added to our aquariums. This happens when we do not give the gasses in our tap water an opportunity to escape into the air prior to adding the water to our aquarium. It is a problem most commonly seen when changing a large percentage of the water. It is also most common during the colder months of the year when our source water is cold and carrying a higher level of dissolved gasses. When we heat this water it becomes supersaturated with gasses that are now looking for an unsaturated medium to escape into. The atmosphere is a prime candidate but unfortunately so are our fish! When these gasses transfer into our fish they form bubbles in the blood stream and other body fluids which can pose a serious risk to the fishes health. How do I know if my fish has GBD? My fish has GBD what can I do? Most of the time GBD is not deadly. The gasses that diffused into the fish will start to diffuse back out once the aquarium water has a lower level of dissolved gasses. Increasing aeration in the tank will help to speed up this process. The bubbles seen in the fins often disappear within a few hours and fish that have lost balance will often regain balance within 1-2 days however. GBD is not to be taken lightly though as chronic exposure can cause damage to the fishes organs and in extreme cases even a single exposure can be lethal. How can I prevent GBD? The good news is that GBD is easily preventable! There are a couple of ways that a person can go about this. The first method would be to age your water. It doesn't even have to be a long term aging. I have found that letting water sit in a bucket for only 5 minutes is sufficient to prevent GBD. When you fill your bucket with water you may notice a slight hazing caused by massive amounts of micro bubbles floating around. As soon as those micro bubbles are gone you are safe to add the water to your aquarium. The second technique is for those of us that fill our tanks direct from the tap via hose. In this case I cover the end of the hose with my thumb so as to create a fine spray as the water goes into the aquarium. This also has been sufficient to prevent GBD. When conditions are perfect discus should feel at ease when someone approaches their tank. They may even rush to the front glass and beg for food. This type of response should be the goal of all hobbyists. It is a clear indication that the discus are comfortable with their surroundings and the conditions in their tank. Unfortunately this is not always the case and many people find their discus hide or dart around the tank when approached. Planning for discus comfort should begin even before the aquarium is set up. The first factor to consider is the height of the aquarium stand. I find 36" to be the minimum height to provide a good comfort level for the fish. Tanks that are situated too low will cause the discus to feel uneasy. Another trick that I have found works well to increase their comfort level is painting or covering the back and sides of the tank. The placement of the tank should also be given careful consideration. Placing the tank directly across from a window or bright light would be a poor choice. It will make the discus feel exposed and anyone passing the tank will create a shadow that may spook the discus. Stocking density is another big factor. Discus are a schooling fish and find safety in numbers. The more discus that are in an aquarium the more bold they will feel. I generally aim for a stocking density of around 5-10 gallons per adult discus. Smaller discus can be stocked much more densely but will need to be thinned out or given a bigger tank as they grow. A dense stocking level also has the added benefit of reducing or even completely eliminating aggression among the discus. Discus love strong aeration but they don't love strong currents. If a strong current is present in the tank they will seek out an area with reduced current and spend the majority of their time huddled there. To avoid this make sure hang on back filters or canister filters are not creating excessive current. Aeration from an air stone and strong air pump are ideal for discus. If the aquarium light is turned off at night then a night light should be kept on in the room so that the discus never go from light to sudden darkness and vice versa. Personally I keep a light on all of my discus 24/7. 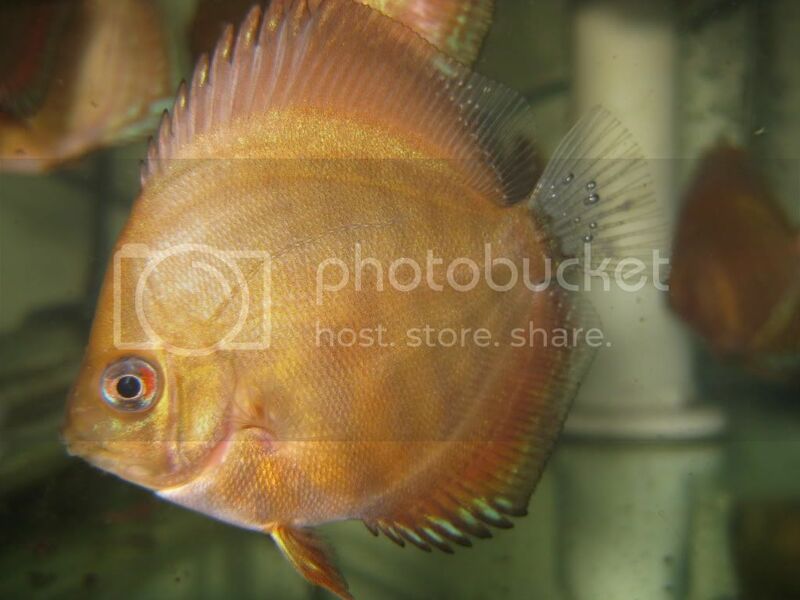 Maintaining a stable PH in the aquarium is mandatory for maintaining happy discus. PH swings are one of the most common problems that discus hobbyists encounter. That is especially true for those of us with soft water as it lacks buffering capacity (the ability of water to resist changes in PH). If the PH in the tank crashes suddenly discus will most often react by dashing around the tank when approached. In extreme cases you may also see clouding of the eyes or excess slime coat being produced. Another more common PH problem that can occur is a gradual drop between water changes. Since the PH drop was gradual the discus had time to adjust without showing signs of stress however when the next water change is performed this will result in a sudden increase in the PH. For small discus this may be lethal. Larger discus may not die but will often show signs of stress after the water change. For these reasons it is always good to be aware of your PH level before and after water changes. If needed steps can be taken to buffer the aquarium water in order to prevent these PH swings that discus dislike so much. Discus that are newly introduced into the aquarium will likely be nervous for the first week or two while they get use to their new surroundings. This is normal and nothing to worry about however if you have discus that have been acting this way for a prolonged period of time it is well worth considering the six points outlined above in this article.